For other uses, see Castleford (disambiguation). The town is the site of a Roman settlement. Within the historical Castleford Borough are the suburbs of Airedale, Cutsyke, Ferry Fryston, Fryston Village, Glasshoughton, Half Acres, Hightown, Lock Lane, Wheldale and Whitwood. Castleford's history dates back to Roman times, archaeological evidence points to modern day Castleford being built upon a Roman army settlement which was called Lagentium (thought to mean 'The Place of the Swordsmen'). Roman funeral urns have been found in modern-day Castleford, giving further evidence to this theory. A Roman milestone was unearthed in Beancroft Road, now believed to be in Leeds City Museum. Queen's Park in Castleford provides evidence of Roundhouses used by the Anglo Saxons. This was a strategic area due to the views of the entire settlement. The history of the area includes Oliver Cromwell’s encampment in nearby Knottingley and Ferrybridge (originally thought to be in Castleford itself) whilst his forces laid siege to Pontefract Castle. In the 19th century, Castleford became a boomtown with the population growing from 1,000 to 14,000 as collieries opened around the town; however, these collieries closed in the 20th century. Ferrybridge Power Station and Kellingley Colliery have also closed (in 2015 and 2016 respectively) and used to employ Castleford residents. The newer warehouses and distribution centres in Glasshoughton have brought in many new jobs to the area. In 2008 Grand Designs presenter Kevin McCloud and Channel 4 led a community regeneration scheme to redevelop Castleford. In February 2017 Castleford Swimming Pool closed. A new modern leisure facility including a swimming pool is proposed for nearby Pontefract Park. Burberry, the retailer and designer label, has a factory in the town which is due to close when a new facility is built in Leeds. The new plant will be a combination of the Castleford and Cross Hills plants, but the Brexit vote has stalled the decision, though Burberry insist it will go ahead. A large Nestlé factory, which produced Toffee Crisp and After Eights for 40 years, closed in 2012 and demolition starting in 2014 to make way for housing. Castleford has previously been home to Dunsford and Wesley Textiles, which at peak business times had three factories in Castleford which have all since ceased production. Castleford was established as an urban district, in the administrative county of the West Riding of Yorkshire in 1894 under the Local Government Act 1894, with an urban district council. Whitwood and Glasshoughton were added to the district in the 1930s. The urban district was incorporated as a municipal borough in 1955. 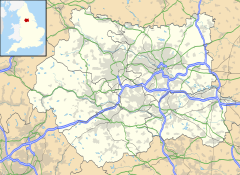 Following the Local Government Act 1972, the municipal borough was abolished on 1 April 1974, it then became an unparished area of the City of Wakefield, a metropolitan borough in West Yorkshire. Castleford is now controlled by Wakefield Council. Three electoral wards cover the town: Airedale and Ferry Fryston; Altofts and Whitwood; and Castleford Central and Glasshoughton. The town contains a Junction 32 multi-store shopping village and the Xscape Leisure Complex, both in the Glasshoughton suburb at the south of the town. In Xscape is Snozone, which used to have Britain's largest indoor real snow slope (but this was edged out by Chillfactore in Manchester) and contains Frankie & Benny's and Nando's restaurants. Castleford has an open and an indoor market, a shopping centre on Carlton Street, a retail park, and Asda, Morrisons, Aldi and Co-operative supermarkets. In December 2013 the Forum, a library and heritage museum, opened in a new building. The town's library had been in temporary accommodation for two years while the old site was redeveloped. The existing frontage was kept, while the building further back was demolished. A new three-floor building was then constructed. The town centre has public houses, bars, and social clubs, although the number of these has declined in recent years[when?] with leisure becoming focused on the Xscape complex. In 2000 three nightclubs were situated in the town centre. Today none remain. Ridings FM is Castleford's local radio station, Launched in 1999, The station can be heard in the town on 106.8 FM. Ridings FM broadcasts to the wider Wakefield District and has a close relationship with the community and is actively involved in local charities fundraising efforts. The town hosts a community radio station called five towns radio available on the internet. The local newspaper is a weekly called Pontefract and Castleford Express. Castleford is only 0.93 miles (1.5 km) away from the M62 at Junction 32 via the A656 road. It has other A roads that criss-cross the town and provide access to Junction 31 on the same motorway. The River Aire and the River Calder have a confluence just north west of the town and also feed the Aire and Calder Navigation. Whilst it is an industrial waterway, it also hosts tourism with moorings on the Castleford Cut of the Navigation. The town has a railway station on the Hallam and Pontefract lines. All trains arrive from the west and leave in that same direction. Trains used to go eastwards to York via Burton Salmon, but passenger workings ceased in 1970 with the section retained for freight workings only. Castleford also had a second service to Leeds that left eastwards and swung north onto the former Castleford to Garforth Line, which would see services calling at Ledston and Kippax, before arriving in Garforth and continuing to Leeds. In 2016, a new £6 million bus station was opened adjacent to the railway station to allow an integrated travel site for the 12,000 people using the bus station per day. The Glasshoughton area of the town is served by its own railway station. The town's primary schools for infants and children are Wheldon Infant School, Castleford Park Junior, Smawthorne Henry Moore, Townville Infant School, Airedale Juniors, Oyster Park Primary, Fairburn View Primary, Three Lane Ends Academy, Acton Pastures and Half Acres. The town's secondary schools for children aged 11–16 are Castleford Academy and Airedale Academy. The town has a small further and higher education college on the Castleford Campus of Wakefield College in Glasshoughton. Castleford is a rugby league town. The local team, Castleford Tigers was formed in 1926, Castleford was one of the twelve founder members of Super League when the new league format was introduced in 1996. The 'Tigers' nickname and logo were introduced in 1992 and the clubs honours include four Challenge Cup and one Super League leaders shield. The club have been based at Wheldon Road since 1927. Castleford also has two other lower league rugby league teams, Castleford Lock Lane and Castleford Panthers. Rugby league in the town was originally represented by Castleford, unrelated to Castleford RUFC, who did not participate in The schism in English rugby and still exist, nor were they predecessors of the current Castleford Tigers who were founded in 1926. The original Castleford rugby league club played in the Northern Union (Rugby Football League) from 1896–97 to 1905–06, and it had one player named Isaac Cole who won a cap for England in 1906 against Other Nationalities. From June 1979 to July 1980, Castleford had its own Speedway racing team, The Kings, based at the Castleford Whitwood Stadium. The circuit was 202 yards and the team never entered the league – only challenge matches were staged. Glasshoughton Welfare play in the Northern Counties East League, Fryston Colliery Welfare were members of this league until they left in 1991 due to ground grading problems. In the 1920s Castleford Town played in the Midland League alongside clubs such as Doncaster Rovers, Chesterfield, Scunthorpe United, Halifax Town, Leeds United (for 1919–20 season only), Lincoln City and Mansfield Town. This league also contained the reserve sides of Sheffield Wednesday, Barnsley, Nottingham Forest, Grimsby Town and Hull City. In 1920 Castleford reached the 2nd round of the FA Cup, losing 2–3 at Bradford Park Avenue. Castleford played at Wheldon Road – when they shut down the ground was taken over by the rugby league team. Main article: Glasshoughton Welfare A.F.C. Main article: Castleford Town F.C. Castleford hosted two greyhound tracks both of which are no longer in existence. The first was in Whitwood and held racing from 1939 until 2001. The second track was the slightly larger 1,500 capacity Castleford Sports Stadium located east of Lock Lane sitting on the north bank of the River Aire. Henry Moore, sculptor who was born and educated in the town. Viv Nicholson, born in Castleford and became famous after she and her husband won the football pools in the early 1960s. On winning £152,000 (£3.5 million in 2015), Nicholson claimed that she would "Spend, spend, spend." Peter Robinson, crime writer famous for his Detective Inspector Banks novels, set in the Yorkshire Dales. Richard Stoker composer and actor was born in Castleford, living at Glasshoughton before moving to London. ^ "City of Wakefield Ward population 2011". Neighbourhood Statistics. Office for National Statistics. Retrieved 1 March 2016. ^ "Castleford Ferry Fryston (ward)". Neighbourhood Statistics. Office for National Statistics. Retrieved 14 November 2016. ^ "Castleford Whitwood (ward)". Neighbourhood Statistics. Office for National Statistics. Retrieved 14 November 2016. ^ "Roman Castleford" (PDF). Wakefield.gov.uk. p. 16. Retrieved 14 November 2016. ^ Historic England. "Castleford Roman Fort (54328)". PastScape. Retrieved 14 November 2016. ^ "Roman Castleford" (PDF). Wakefield.gov.uk. p. 7. Retrieved 14 November 2016. ^ "Early History". Knottingleyonline. Retrieved 14 November 2016. ^ "Last Kellingley coal miners will receive severance pay". BBC News. 10 December 2015. Retrieved 14 November 2016. ^ "Ferrybridge C Power Station officially closes after 50 years". BBC News. 31 March 2016. Retrieved 14 November 2016. ^ "'Anyone who expected quick and cheap regeneration was deluding themselves'". The Yorkshire Post. 15 March 2010. Retrieved 14 November 2016. ^ Brown. Maggie (2008). The Guardian. Kevin McCloud and the Big Town Plan: a heroic failure?. ^ Cooper, Sam (14 November 2015). "'End of an era' as Castleford Burberry factory to close". Pontefract & Castleford Express. Retrieved 14 November 2016. ^ Butler, Sarah (14 July 2016). "Burberry puts new Leeds factory on pause". The Guardian. Retrieved 14 November 2016. ^ Treanor, Jill (10 December 2010). "40 years and billions of mints later, Nestlé to close After Eight factory". The Guardian. Retrieved 14 November 2016. ^ "1,000 new homes planned at former Hickson and Nestle sites". Pontefract & Castleford Express. 12 August 2014. Retrieved 14 November 2016. ^ "Homepage". Chillfactore.com. Retrieved 14 November 2016. ^ "Centre Map". xscapeyorkshire.co.uk. Retrieved 14 November 2016. ^ "Homepage". Friends of Castleford Library. Retrieved 14 November 2016. ^ "105" (Map). York & Selby (C ed.). 1:50,000. Landranger. Ordnance Survey. 2014. ISBN 9780319262030. ^ "Castleford Cut". Waterside Mooring. Retrieved 14 November 2016. ^ Williams, Michael (2015). "8. In the company of ghosts in Britain's spookiest service". The Trains Now Departed. London: Arrow Books. pp. 159–160. ISBN 9780099590583. ^ "Church Fenton". Disused Stations. Retrieved 14 November 2016. ^ "Castleford to Garforth". Lost railways of West Yorkshire. Retrieved 14 November 2016. ^ "Castleford Bus Station now open". WYMetro. February 2016. Retrieved 14 November 2016. ^ "Castleford Campus". wakefield.ac.uk. Retrieved 14 November 2016. ^ Raymond Fletcher; David Howes (1995). Rothmans Rugby League Yearbook 1995–1996. London: Headline Book Publishing. p. 164. ISBN 0-7472-7817-2. ^ "England Statistics at englandrl.co.uk". englandrl. 31 December 2011. Retrieved 1 January 2012. ^ "Licenced Tracks". Greyhound Racing History. ^ "Independent Tracks". Greyhound Racing History. ^ Catlow, Richard (31 October 2011). "Vote for Yorkshire's Greatest... Creative People". Retrieved 14 November 2016. ^ Davies, Caroline (12 April 2015). "'Spend, spend, spend' football pools winner, Viv Nicholson, dies aged 79". The Guardian. Retrieved 14 November 2016. ^ Herbert, Rosemary (2003). Whodunit? A who's who in mystery and crime writing. Oxford: University Press. p. 169. ISBN 0195157613. Brown, Maggie (2008). The Guardian. Kevin McCloud and the Big Town Plan: a heroic failure?.